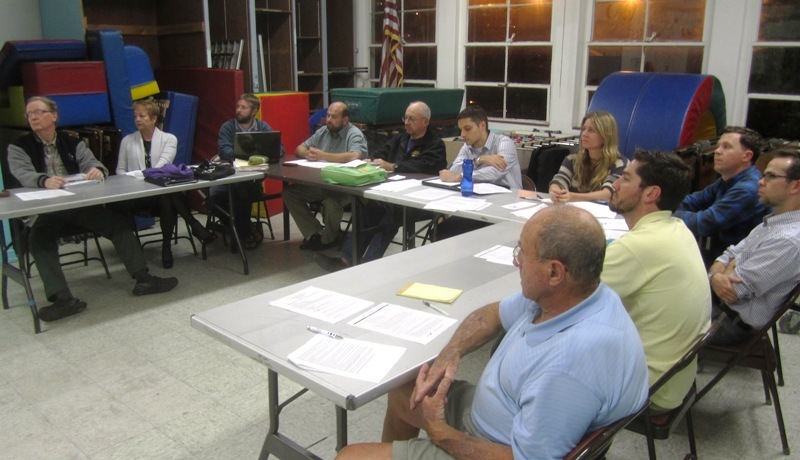 Board members (in seat order L to R): Kevin Becker, Barbara Schmidtknecht, Scott Therkalsen, Gio Ingolia, Tom Gawronski, Pete Ruscitti, Rae Hartigan, Drew Wilson, Andrew Waltz, John Ambert, Bill Bushe. 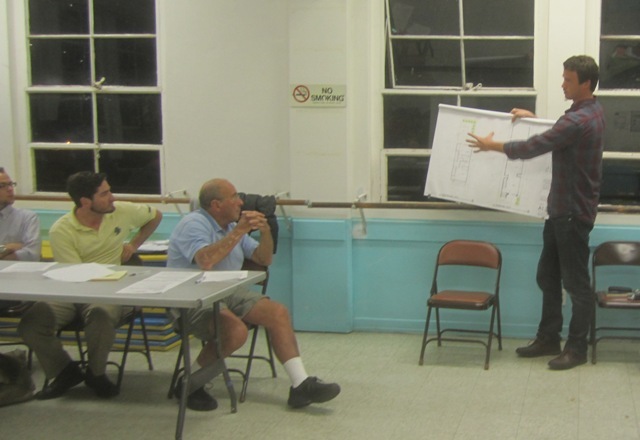 Last night, the OB Planning Board approved the project at 4746 Brighton Avenue – a project that involves the demolition of an older, existing house on a large lot and the construction of two 2-story houses – that several Board members described as “incompatible” with the surrounding neighborhood and with the new Precise Plan. Yet, by a vote of 7 to 4, the Board approved the project. After the developer’s adult son Yale Jallos had made his presentation to the full board, audience members and then Board members had their say. Jallos had already made one pitch at the Board’s subcommittee, the Project Review committee, on Feb. 19th, and they had simply punted the project for the entire Board to consider without approving or denying it. It was a full house in the audience as I counted 30 people in the chairs. Last night Jallos claimed that he had modified his plans from suggestions and requirements that the review committee had pushed in order it to be more friendly to neighbors. An issue was the original design blocking sunlight getting to back units on the adjoining property. Another issue Board members focused on was the proposed 6 foot front fence. Both houses will have 3 bedrooms and 2 1/2 baths on the 5,000 square foot lot, which will now have two tall houses side by side. Jallos – trying hard to be liked – said he could have designed 4 houses but only is doing two. Plus, he reminded the Board, his houses are just under the 30 foot height limit and are within the FAR. He defended his 6 foot fence “to keep the drunks out” as the first 3 feet is solid, and the other 3 feet 50% solid. The building designs are of a distinctly “modern” type with glass, aluminum and stucco materials producing two narrow houses, with very little distance between them and both presented at the street. Jallos said he planned to live in one of the units. 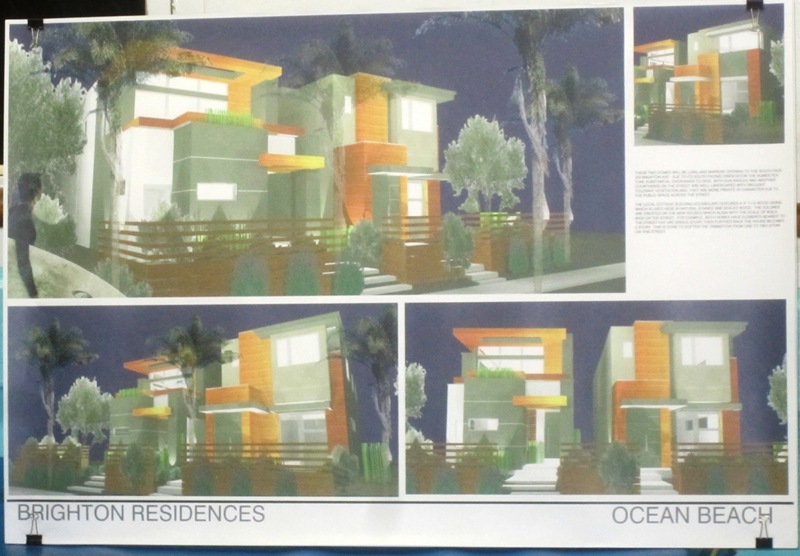 One Board member recalled that when Jallos appeared before the Board a while ago proposing two other similarly-designed 2 story houses which were approved, he also told them then that he planned to live in one of them. Both were sold however later after construction – and obviously he wasn’t living in any of them. Several members of the audience questioned Jallos about the lack of compatibility with the surrounding homes, plus one couple who came in together each got up and said they liked the design. Neighbor Lisa Shook read Dixie Brien’s letter – also read at the Project review meeting – that asserted that the design was not compatible with the rest of the block, and called them “shoe-box prisons” and complained that two large trees were torn down to make way for the project. Brien is an adjoining property owner. Shook also read another letter from Kevin, a property owner, who questioned whether designed two 2-storied houses only 6 feet apart would take away sunlight from neighbors. “This building is not by a preservationist,” the letter stated, and also claimed that “this builder said he lived in the last one” and was only saying this to garner support for his project. Kevin also said in his letter that “to keep drunks out is a shallow reason for the 6 foot fence,” and that the only problems on the block from drunks are during the OB Street Fair and July 4th. To this, Jallos retorted, “You’ll be looking at bamboo,” as he had proposed adding a bamboo patch to this design. Shook said that she had walked her block and “out of 16 homes on the block, 12 have re-modeled,” but none of them have attempted to install their second units right at the street, and instead had placed them behind the first house. Another neighbor asked Jallos about this, but he did not answer directly. Then it became time for Board comments and nearly every member made some kind of statement – much of the latter statements echoing the earlier ones. It was up to Board member Scott Therkalsen to make the argument that Jallos’ designs were not compatible with the neighborhood nor with the OB Precise Plan. I drove around that block, talked to neighbors, went back to the Precise Plan. The Plan ensures that scale and bulk are compatible. Therkalsen cited the Precise Plan as recommending against large areas of blank surface – as these designs show – and that it calls for minimizing abrupt changes – which the design does not do. “New development should take designs from those already developed,” he said, and that this building should reflect current design standards. Scott said he stood in front of Jallos’ other houses, and now he must oppose this project. Other Board members were conflicted on the project they said. Then it was Pete Ruscitti’s turn. “It comes down to a judgment call,” he said. “The applicant has met the requirements of the city.” The 1975 Precise Plan, he said, uses the adjective “excessive” and asks fro “small scale development”. Ruscitti admitted that the design “does not look like any other house in OB except the other two you built.” He praised the developer for doing some modifications in response to the board and neighbor concerns. Yet he expressed sympathy with the neighbors. In the end, he gave his support to the project but “not overwhelming support” and said “the fence needs to meet code”. Member Raeanon Hartigan said the project “creates a fortress – not very welcoming.” But because Jallos had made changes, she supported it. Other Board members like that Jallos had done some modifications and for those members, that was enough to support what was before them, despite not having any updated plans or drawings and only taking the developer’s word for what he promised to do. “People don’t like this style,” Drew Wilson said, “but we’re not style police” and he had problems with the fence as “OB is open”. John Ambert gushed: “I think what you’ve created is beautiful”, and said, ” I’m on the side of property rights and support it.” Jallos thanked him. Other comments from the Board followed Ruscitti’s leanings. Finally, there was a motion to approve the project with the pledged modifications and with the fence bring brought to code. Gawronksi called for a show of hands – and it was 7 to 4 for approval. Those voting against the project included Therkalsen, Gawronski, Barbara Schmidtknecht and Giovanni Ingolia. Those approving the project include: Andrew Waltz, Kevin Becker, Ambert, Wilson, Bill Bushe, Ruscitti and Hartigan. Glad it was approved, I love the look of these places. Plus they are energy efficient. Well, as long as you like them, it’s ok. It’s your world, we’re just living in it. Right. Because I clearly was saying my opinion is the only valid one. Thank you as always for the coverage. Okay, stand corrected, thanks Pete. However, from the audience I would have to say the two sets of images were extremely identical. The modifications were not easily discernible. I am the one who presented this design, and I did have the new renderings available sitting right in the front of the room, but no one took a picture. Also, there were MANY positive comments from community members about the revised design, and many people in OB who know me and came to support my project. Also, the majority of the board including some that abstained to vote were very complimentary of the deign calling it “beautiful” and commending my willingness to make changes for the community. None of this was covered in this article. The only opposition was from the next door neighbor, which is pretty much gonna happen in every construction project. Many residents from surrounding blocks are looking forward to seeing the new houses. One of which I will live in. Watch me. Although this article was very biased, Frank does good work for OB in many cases, and I can see how the OB rag serves the community on many instances. However, I am part of this community now, first came to Ob 14 years ago and had m first job after college was here in OB. I love it, and I can finally build myself something to live in here. I will stand up for myself when not fairly represented publicly. Thanks to everyone who supported me last night I was overwhelmed by the positive comments! It means a lot guys. I was at both meeting. If you call two people speaking on your behalf MANY. More of the council spoke on your behalf with regard to the design. Also, the neighbor is not the only one against it. I spoke with people on Long Branch who informed me you bought the property when the previous owner died. Her sons couldn’t afford to pay off the reverse mortgage. And just so everyone is clear, Yale himself bought up the subject, once again, that he was going to live in this house. The member responded by saying that is what he said when he asked to approve the Long Branch project and that member indicated that that was one of the reason he had voted for the project because Yale had indicated that he was going to live there. Then Yale stated at the meeting that he had lost his job and had to sell the units to save his house in Clairemont. He did fail to tell us that he is also has a job as a realtor since 2010 (he sold the units in 2012) and also owns his own business called Loma Consulting and Design (since 2010). Yale brought up the subject about living there again. It is quite clear the the Precise Plan is questionable and most of the people who approved it stated that “technically” he followed all the rules so with regard to the planning and he did make some minor changes. He already chopped down one tree yesterday which was a monstrosity, drive by and check out the upkeep of the house. It certainly is due for demolition, however, building his design in that neighborhood is not keeping with current look. Ok, I did speak too soon with regards to part of that statement. The article did mention some positive comments from the project by the board. Thanks, Frank. I apologize for my mistake there. But it just read in a very biased way overall, and the few negative comments received way more attention than the many positive comments in the article. Would you contact me re this project? We would be good neighbors! Projects like these are a tough question, to be sure. I’d say that anyone that disagrees isn’t grappling with it enough. While I personally support the project and design, I do not disagree with much of anything project opponents have said. If the board doesn’t take a strict interpretation of their own Precise Plan, how can anyone else be expected to? The proposed structures are clearly bigger in scale than the neighboring ones, particularly on the street side. That’s not debatable. One can certainly argue that they represent a form of gentrification, which is basically “death by a thousand cuts” in practice, as one former board member put it. Like most everyone else, my own preference would be to see the preservation of small-scale cottage development, front yards and “openness” that was referred to last night in terms of OB’s character. With that said, there was little chance of even the original design losing an “appeal” to the City Council, and significantly less so after the legitimate revisions/concessions that were made by the applicant, who also seemed to intimate that he is now not even building to his allowable FAR with the revised project (others can confirm or deny this). As great a document as it was for its time, the existing Precise Plan is nearly 40 years old, and a dozen examples (at least) of more egregiously out-of-scale projects exist throughout that zone and OB on the whole. I have dutifully made the “excessive bulk and scale” argument on several occasions myself, and simply put, so long as applicants are building within their allowable FAR, it is *clearly* not deemed to be a legally-defensible argument by the decision-makers (at least not the ones when I served from 2008-2012). To be clear, the City hasn’t even toed the line on actual FAR variances (the de facto rezoning of West Point Loma Avenue and North OB), never mind projects that fall within their allowable FAR or even below it, as this one might. There is a perception that the OBPB are power brokers in this, but in my experience on the board, many projects exactly like this were routinely voted against on exactly the same grounds, only to have the Board’s recommendation, rooted firmly in interpretations of their own governing document, discarded by the decision-makers. I will let others speak for themselves on that, but I would doubt there is much disagreement there. It happened over and over, and there should be no misunderstanding about this. At times, and maybe more than a few of them, I felt that votes were a choice between digging in my heels and being ignored, or working with applicants to get some degree of legitimate compromise in order to make projects more appropriate to their context and neighbors. I’ll be perfectly honest and say that I don’t know if there is a right answer there, but that in my own opinion, any blame for that does not lay with the board members who have to make that decision, or with applicants like Mr. Jallos who play within the rules and are willing to work with their neighbors, but rather with a prevailing culture at the City (not every person or department) that generally does not value the community planning process. Whatever people want for the future of OB, what I hope for is twofold. The community staying/getting engaged and holding their electeds accountable to the rules and processes that are already in place, and the timely completion of a Community Plan update that is more relevant to the challenges of 2014 and beyond. Thanks Seth – always appreciate your reasoned arguments and efforts at discussion. 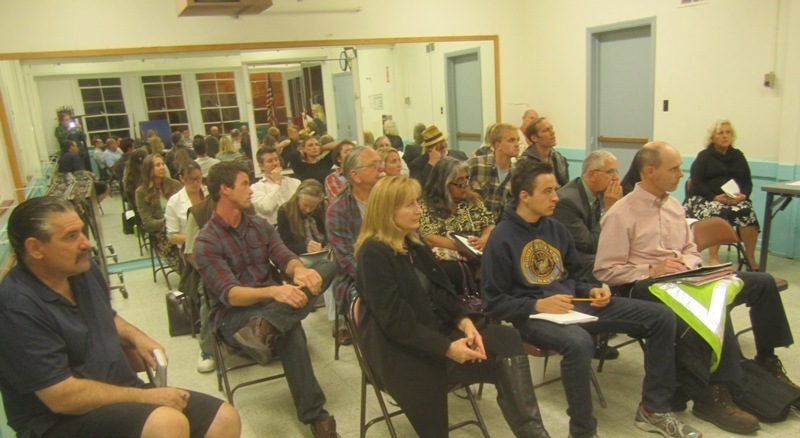 It is hard for the Planning Board members to quantify neighborhood incompatibility. A project that requires no variances and satisfies FAR requirements can still end up being incompatible with the neighborhood. Also a project that requires some variances can be compatible. The San Diego training for planning board members doesn’t do much to prepare volunteers to comment on community character. In my opinion there is a well of bad faith that has been built up by out-of-character developments. Projects getting presented now are paying for things that have happened in the past. I’m talking about developments like David Stebbins’ on West Point Loma. It can be a tough to visualize what something will look like in it’s surroundings before it is built. In my years on the Planning Board I remember the triple-shoe-box on Voltaire (4853-4855 I believe). Some members wanted to oppose it but felt they couldn’t because it satisfied FAR requirements. City planners only reinforce that notion. I’d say that one was out of character then and still is today and regret the planning board approving it. As for this project I couldn’t say, I got priced out of OB years ago. Too many people push for too many homes. Two residences on one lot increases density. Inch by inch, step by step, slowly the Three Stooges turned and discovered there are no spaces left to build upon. The design of these units is rather pleasant. They are much nicer than that monolith someone built on Bermuda near the corner w/ Ebers. Does the new structure actually block sunlight from existing structures? Frank, remember that giant two story house built next to Tanja Winter’s one story home in La Jolla. She didn’t see any sun until about eleven a.m.! Perhaps I am overreacting. I will reconsider whether I need sunlight or not. It is my understanding that there are actually two lots at this location and the original structure occupied both lots. Correct? One address: 4746 Brighton Ave. Yes, the old house straddled two lots, a plot never “condoizsed” – 50 by 100. You are correct, Dan. Just as there were actually 4 lots at that dreadful looking Ebers and Santa Monica project. This has always been the case, some builders just straddled the lines of multiple lots back in the day. Not sure, but I don’t believe what Mr. Jallos is proposing has ever been non-compliant with code, it’s just that people didn’t build to that scale in previous eras (for what were just summer homes for many people when constructed). As to compliance with the Precise Plan, it likely doesn’t meet the “spirit” of what is written, but as Pete R pointed out at the meeting, the existing Precise Plan doesn’t have as much teeth as the draft one that is not yet finalized in terms of making a solid case against a project like this one. Not only that, but there are many post-1975 structures within the same zone that are very similar in scale to what is being proposed, they just don’t stand out so much relative to their neighbors on the same block. My own take would be that if people are trying to use the Precise Plan to block a project like this, it is probably a losing fight, but that there is enough there to compel revisions that make it more sensitive to its context and neighbors – which is exactly what happened here. Others may differ on that, of course. I’d rather have two smaller units than one McMansion on a consolidated lot, personally. These units will not be “affordable” when they originally hit the market, but 40 years down the line, they may end up being the cottages of today – if that makes any sense. Aside from the idea that these type of units don’t fit into the character of OB, it is concerning that Mr. Jallos was supposedly going to live in one of the other units from two years ago, but didn’t. Fool me once, shame on you. Fool me twice, shame on me. Should it really matter to the board who is going to live in those units? I agree with Seth…two units at the proposed design is much more in character than one big unit maxing out the FAR. Gotta be careful what you wish for. I don’t know a lot about the project other than what was published on this site. It seems Mr. Jallos was accommodating and agreed to make changes based on feedback of the board….that sure should mean something about his character. One cannot make everybody happy. Anyhow, I look forward to the next project which comes to board and to follow the discussions and see the designs. Lastly, are their any architects in San Diego that like to design Spanish style? If so, please post. TX! I agree that it shouldn’t (and doesn’t matter) to the board who lives in those units. But an issue raised is the previous “deceit” from the other project. That is also a reflection of someone’s character. Deceit and misdirection is the hallmark of the Downtown political establishment. Does anyone know if he did live in it for a period of time or if he didn’t maybe there was a good reason …….. the next door neighbor was a lunatic or ??? The fact that the board would ask this question…”do you plan to live in it”, should be forbidden going forward. That question itself implies that if you say “no” then the project is not looked as favorably. As you said it really should not matter. Is this person’s character in question to the people of OB? He did not have to be or try to be accommodating to adjacent neighbors….but he did and that sounds respectful, no? Yeah, not comfortable with that, either. Voting to recommend structures, not people. Applicant gave an explanation that should be taken at face value, in my opinion, and I also think that’s what the board did. It’s ok to encourage owner occupancy in general. OB has a lot of rental stock and pride of ownership usually is a good thing. There are a multitude of reasons why someone would change their mind about living in a certain house though. Job change, marriage, divorce, rental income, etc. For all the board knows an owner could want to be living a certain property but not be able to. If the owners want to offer the information I think the board can take it into consideration, but it isn’t fair to expect it or to use it to attack someone’s character without having the full story. Shame on us – one of the units was sold and one is currently rented. You’re going to LOVE your new neighbor Daniel. His dogs bark all the time. Come on Yale. I think you are taking this a bit too personally. Saying, “However, I’m a part of this community now”. You are making it sound like someone is attacking you personally. Just wondering, at the last meeting, you asked me “what kind of a fence did I want” when I was looking at the plans asking where the mutual fence line was. Does that offer still stand? Doesn’t the one that pays for the fence get to pick the fence? When you buy your clothes, who picks them out? Brien’s house with beer to ask her why she hated you so much and what you could do to make her happy so she would quit contacting Morris Dye at the City so it wouldnt cost you so much money. Were you really there two hours until she had to ask you to leave? Did you also tell her that you had some bad days and broke up with your girlfriend and that is why you acted so crazy? Did you actually imply to her that you would rather give her money than to pay the city money to defend the process against her? I contacted Morris Dye myself today and I still can’t quite understand why he would contact you to let you know about her conversation with him? I was under the impression when I spoke with his supervisor, Sandra Teasley, today, she stated that when an appeal is done, it becomes public record. However, Dixie called Morris directly and I would like to know why you are his land line into what is happening. I also contacted Morris myself today and I plan to have to his involvement with this project reviewed with regards to other projects you have been involved. I didnt know Morris had so much time on his hands to inform you of Dixie’s comments. Wow, I talk to my neighbors to stay friends and make peace. You told me that Dixie had a problem with my plans, you told me this in a public meeting. I finally got a free evening to stop by and talk to her. It was a pleasant visit and I definitely did not offer anyone money. We talked about the changes I made to accommodate your requests at community meetings, and I expressed willingness to go even further and take suggestions on landscape elements from her. I’m just trying to talk to my neighbors especially the one you told me is most concerned. I am living there and want to friends with my neighbors, talking is a good start. I wish you all the best. I hope we can both move on with our lives and enjoy life! Not stress over this stuff. I’m a guy who loves architecture, building a house. If you ever want to build a house, I will be in full support of your FREEDOM to build within the code on your property. In the meantime, do not try to make my attempts at peace and neighborhood connectivity look like something else. As a resident property owner on the 4700 block of Brighton Ave. what I got out of the meeting is that when and if I want to build something on my property that I should first make the design that I really want. Then create plans for something hideous and present them to the board. Then when the board makes some suggestions, come back with my design that I really want and show how much better the ‘new’ plans are. Then since I made changes as they requested I will get my ‘new’ plans accepted even though they may not be up to standards, but as least I tried. I understand that the boards recommendations to the city are just that, and can be overridden, but why have a precise plan when you are not going use it to make recommendations to the city? I was at first not aware that there were 2 legal lots involved that were never combined into one 50 x 100 lot. So I can see why he chose to build 2 narrow structures side by side instead of building one in front and one in the back as all the other remodels on the block did. Cost and convenience. And also not have to provide more off street parking for have 6 bedrooms on the one lot. I feel sorry for the tenant buying the new unit to the east. They will have no ocean breeze to provide natural cooling in the summer, and no afternoon light in the winter. Guess that is why he will be occupying the unit to the west. Both situations that would have been eliminated by building on the full lot front and back. I also still not clear about the zoning requirement of the RM1-1 minimum lot size…. This is from the San Diego Municipal Code….. So it says that he should not be allowed to build on 2500 square feet. This is new stuff for me so if someone can explain to me why he is allowed to build NEW construction on a 2500 sq ft lot please do. I understand the exemption on a remodel, but these are not remodels.. these are new construction. …too bad about the break up. She was a babe!